W. W. Norton & Company, 9780393355475, 288pp. 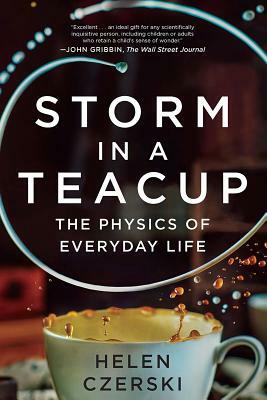 Storm in a Teacup is Helen Czerski's lively, entertaining, and richly informed introduction to the world of physics. Czerski provides the tools to alter the way we see everything around us by linking ordinary objects and occurrences, like popcorn popping, coffee stains, and fridge magnets, to big ideas like climate change, the energy crisis, or innovative medical testing. She provides answers to vexing questions: How do ducks keep their feet warm when walking on ice? Why does it take so long for ketchup to come out of a bottle? Why does milk, when added to tea, look like billowing storm clouds? In an engaging voice at once warm and witty, Czerski shares her stunning breadth of knowledge to lift the veil of familiarity from the ordinary.